Under the high-patronage of Dr. Khalid Bin Abdul Rahman Al-Ohaly President of the Arabian Gulf University, Manama, Kingdom of Bahrain and Dr. Ismahane Elouafi Director General of International Center for Biosaline Agriculture, Dubai, United Arab Emirates, the international workshop on “Climate Change and Soil Salinity Dynamics - Threats and Challenges” will be held at the Arabian Gulf University, Manama (Kingdom of Bahrain) from 11 to 12 April 2018. The workshop targets an international participation and cooperation for global Awareness, underscores the need to work together to find global solutions to our most-pressing problems on soil salinization. 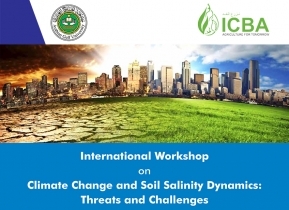 We wish to invite researchers and multi-stakeholders around the world to this event, which is an ideal forum for sharing up-to-date information on the latest developments, exchange of ideas, identification of future trends and networking with the international geoscience, soil, environment, agronomy, GIS and remote sensing, and agriculture community on “Climate change and soil salinity dynamics”.